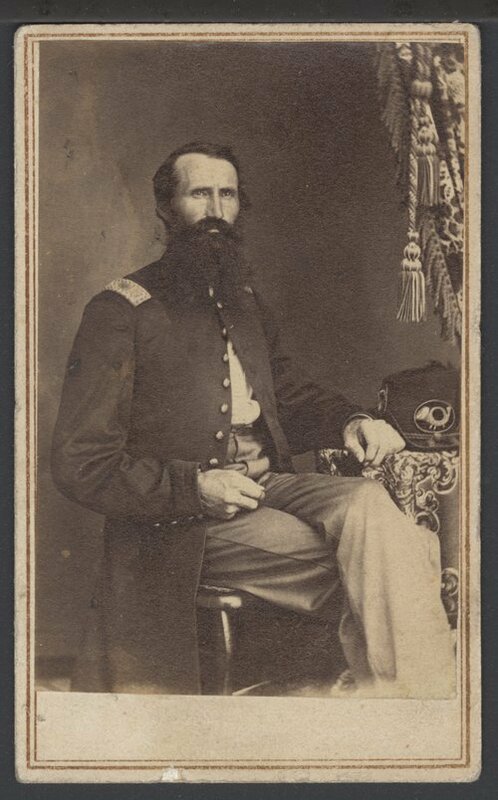 This carte de visite shows Major Martin Anderson, (1817 -1897), from Circleville, Kansas. A commander of Union forces during the Civil War Anderson joined the military ranks, on August 30, 1862, when he mustered into Company B of the 11th Kansas Volunteer Infantry Regiment as company captain. He rose through the military ranks to major, on November 22, 1863 after the regiment was reassigned, in the summer of 1863, as the 11th Kansas Volunteer Cavalry Regiment. Anderson served in this capacity until he mustered out, on September 18, 1865, at Fort Leavenworth. After the war he ran for political office in 1866 and was elected the state treasurer of Kansas, (1867-1869). Anderson remained actively involved in community affairs until his passing on July 9, 1897, at the age of eighty.